WINGSPAN renovations will soon come to an end and we are getting excited for the new delicious food options included in the renovations. You may have noticed that some restaurants have been serving our travelers for some time now, and they each have something special about them. We’ve compiled a list of food options currently open and set to open after WINGSPAN renovations are complete. Located in baggage claim and the Grand Hall, DD has more than 3,100 stores in 30 countries outside of the U.S., and has been serving customers internationally for over 40 years. In 1948, William Rosenberg and Stephen So opened their first restaurant, Open Kettle, in Quincy, Massachusetts before renaming it Dunkin’ Donuts in 1950. It is an American global doughnut company and coffeehouse chain now based in Canton, Massachusetts. 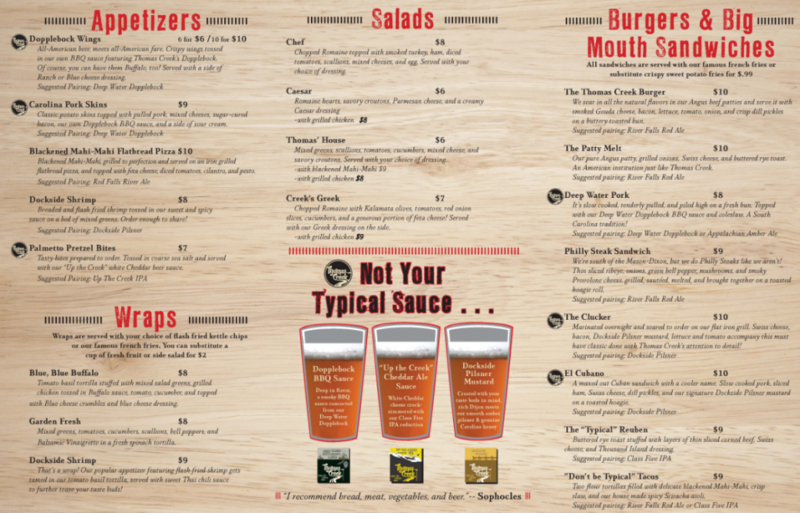 A Greenville-founded brewery, Thomas Creek became the name of one of the first restaurants to open during WINGSPAN in 2015. 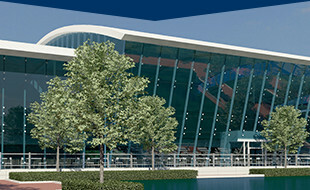 The restaurant is located in Concourse A, facing Greenville, its hometown’s side of the airport. Some menu items pay homage to the South and boy are they yummy! Flying through GSP in the morning? They serve a mean breakfast as well! Just like the City of Spartanburg, RJ Rockers Flight Room is located on the north end of the airport, in Concourse B. A Spartanburg-founded brewery, RJ Rockers will quench your thirst with one of their tasty brews and pair it with an appetizer! This Grill was established in honor of the Flatwood community, a small town where GSP now resides. The inside walls of the restaurant are lined with pictures of residents of the Flatwood community including the baseball team, the Flatwood Peaches. 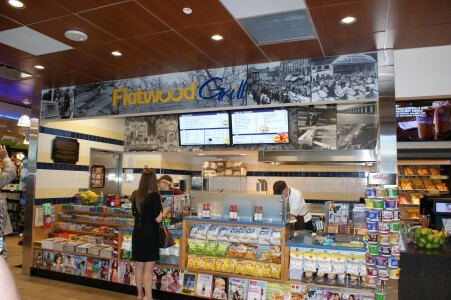 With breakfast served all day and a range of American fare, Flatwood Grill is sure to become a traveler favorite! Hudson is not necessarily a restaurant, but you can still grab a tasty snack along with a good read, or a comfy pillow at one of the four locations in the airport. Puck’s concepts are known to use quality, local ingredients, inventive techniques and approachability. Located in GSP’s Grand Hall, The Kitchen will feature a full-service restaurant, bar and to-go counter. Known as Washington DC’s all-American hot dog joint, DC-3 is coming to GSP in the Grand Hall between concourses A and B. Not only do they sell out of world hotdogs, but also breakfast menu items that include a breakfast croissant, a breakfast dog and more. Need we say more? This Southern, and now nationwide chain, has had people “Eat Mor Chikin” since 1946 and now has more than 2,000 restaurants in the United States, and one in Canada. And they’ll soon have one at GSP! Needless to say, we are beyond excited for these new restaurants set to open this summer and are already in love with the ones operating today. What’s your favorite restaurant at GSP?